Have you ever felt creatively "stuck," unsure of where to go next with a painting or drawing? Are you afraid to even pick up a paint brush, form the clay, or make that necklace you have been thinking about forever? Creativity and the end results of creating can be scary and overwhelming. If you have ever felt this way about being creative, then this is the workshop for you! In this four week workshop we will focus on forming or expanding your meditation and creative practices, helping you get un-stuck, as well as having the courage and discipline to make creating and meditation part of your daily routine. Meditation serves to significantly enhance our creative process by helping us synchronize mind and body, intuitive and intellectual abilities, and our felt and thought senses. By engaging in the mindfulness and awareness practices of meditation, we discover a path to genuine spontaneity and unselfconscious expression. This workshop will offer both meditation and meditation in action exercises such as paste paper, journal making, non-objective drawing, and personal symbol creations. 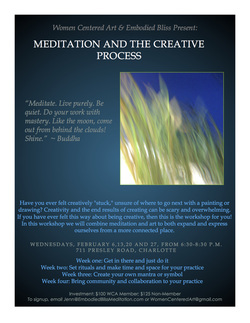 2.27.2013: We will explore how community and collaboration play a role in our daily meditation and creative lives, and create a collaborative, non-objective drawing. When: February 6, 13, 20, 27; from 6:30-8:30 p.m.